The two electric water bombers ready to take to the sky. Chris McHugh's Fletcher Special. This plane was designed by Chris McHugh but inspired by Barry Fletcher's (hence the name) "Classic". This model performs very well in the capable hands of Chris. 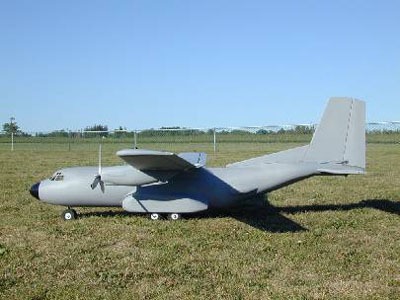 This is Gerry Key's C-160 Transall. 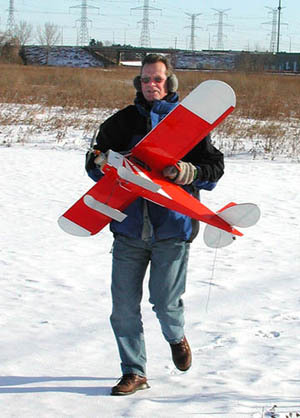 It's built from a Flair products kit with a 72" wing span, 53" length and weights 8 1/2 lbs. It's powered by two Jeti 30-3 brushless motors with two Jeti JES40-3P speed controls. It carries two ten cell 2400 mah battery packs wired in parallel and has five FMA HS81 & 2 FMA 225BB sevos. Rod Schneider bringing back his cub after a smooth but very very chilly flight in the bright morning sun. It was -25 Deg C !!!! just tested my new (8 cell) HeCells 1000mAh in my Cap powered with a Mega 15/16/7 motor turning 8.5x5 Aronut prop. It was amazing. The performance was better then ever with NiCds and on the second flight I clocked 14 minutes of full acrobatics. Only one drawback so far the NiHh do not like to give up power when they are cold. Flying in -15C it took 3 minutes to warm them up before they came on full. Next time I will not let them chill before flying. I would strongly recommend this upgrade. I got my from Sheldon Hobbies. The 8 cell pack weighs in at 5.75 oz only .5 oz more but the performance makes up for it. I also tried the same with a 10x4.7 prop and got prop hanging performance with better then 1:1 thrust ratio.